Point made. The intersection of Street Art and public advertising negates all of Street Art's power to communicate individual messages and instead champions the market as the only voice worth listening to. 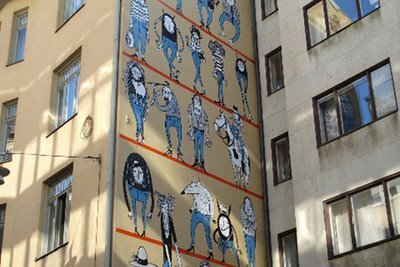 Two years in the making, Levis found their creative mind to showcase his/her artwork at a wall in Stockholm. With the help of Vice Magazine, a list of 200 contributors was narrowed to the winner, Mia Nilsson. Her illustration can be seen at Grevturegatan 8, on a 5 X 11 meter wall for the next couple of months. Following an inspiration of childhood memories, Mia’s Levis 501 campaign showcases a nostalgic experience of kids trying to be cool in their 501’s.